February 10, 2016, 1:26 PM · In an effort to promote the coverage of live violin performance, Violinist.com each week presents links to reviews of notable concerts and recitals around the world. Patricia Kopatchinskaja performed the Schumann with the Orchestra of the Age of Enlightenment. The Guardian: "...to call Kopatchinskaja’s approach to it unconventional is only the start. She and her gut-stringed violin pounced, pleaded, skittered and swung through it, and Alsop and the orchestra backed her choices all the way....Perhaps no violinist can make this work sound like a masterpiece, though plenty can make it sound intermittently noble, graceful or pretty. Kopatchinskaja, instead, made it sound alive." 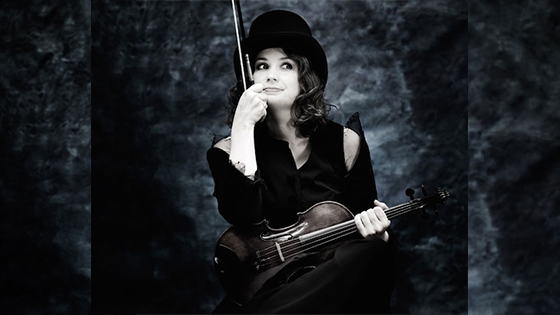 The Telegraph: "Patricia Kopatchinskaja, a hyper-intense player who throws herself into every performance with a display of barefoot stomping, is the antithesis of those perfectly honed violinists who sometimes miss the point of this music." Patricia-Kopatchinskaja. Photo by Julia Wesely. Daniel Hope performed Mendelssohn's "juvenile" violin concerto with the New Century Chamber Orchestra. San Francisco Classical Voice: "This chipper and pointed performance, loaded with melodic charm, banished thoughts of the more famous E Minor Mendelssohn concerto." David Coucheron performed the Brahms with the Atlanta Symphony Orchestra. Arts ATL: "Coucheron brought forth an impressive performance, the first movement’s cadenza being among the high points. It was well-underscored by Spano and the ASO." Atlanta Journal-Constitution: "Even in the trickiest passages, which occur at the top of the violin’s range and at breakneck speed, Coucheron filled his playing with an aggressive self-assurance and a bright tone. The most affecting passages, though, came during the slower second movement, where Coucheron had time to wring added passion from every note." Chloe Hanslip performed the Tchaikovsky with the Buffalo Philharmonic Orchestra. South Florida Classical Review: "Hanslip’s deep tone and fine sense of pacing brought elegance to the opening melody. Her tone turned silvery during the heroic second theme, which in her hands was an exercise in mature restraint. This restraint was especially apparent in the finale, which can often sound like a race to the finish but here sounded more like a Russian dance." Palm Beach Daily News: "(The Tchaikovsky Concerto's) demands hold no terrors for Hanslip, who negotiated the wildest passages with aplomb. But she was best in the lyric heart of the work, especially the songful second movement. And she joined concertmaster Dennis Kim in a duo as an encore, from a suite by Leclair." Joshua Bell performed Bruch's Violin Concerto No. 1 with the Fort Worth Symphony Orchestra. Star-Telegram: "It’s a fine piece and seemed all the finer in Bell’s superb interpretation. His unerring precision of pitch was amazing, as was his easy interpretive command of a work that contrasts musical drama with lyrical beauty." Vadim Gluzman performed the Brahms with the Kansas City Symphony. The Kansas City Star: "With the air of a champion, he presented balanced, sorrowful double-stops, the gorgeous melody and a furious technical ability. His sound filled every nook in the hall during the captivating cadenza." Jennifer Koh performed Bartok's Violin Concerto No. 2 with the Milwaukee Symphony Orchestra. Journal Sentinel: "Koh gave an intense, dramatic performance of the concerto, blending the melodic simplicity of its folk elements with the musical complexity of 12-tone writing that remains stubbornly tonal, and some searing virtuosity. Koh played with absolute conviction, vivid musical arcs and a constant drive that swept the listener through the piece." Anthony Marwood performed the Vasks with the St. Louis Symphony Orchestra. St. Louis Post-Dispatch: "The concerto is primarily lyrical (with a huge storm near the end), melancholy, beautiful and tinged with regrets and tears. Highly challenging technically, there are echoes of the music of Henryk Górecki and Arvo Pärt, but the work is overwhelmingly from Vasks’ own sonic world." February 10, 2016 at 08:50 PM · Playing a duet with the concertmaster for an encore. Now there's a nice touch. I wonder how often it's done.